Dana Villas is an all-inclusive family friendly hotel, located in a peaceful area on the Firostefani cliffside just outside Fira’s centre, and offers amazing views of volcano and the famous Santorini sunset. Featuring a large swimming pool, hot tub and restaurant by the caldera, this hotel is an ideal venue to retreat into in comfort and amidst famous Cycladic hospitality. Boasting of traditional white washed Santorini buildings, this hotel offers 11 categories of rooms, suites and villas for all guests to choose from. The rooms offer lovely views of the Sunset, caldera bay, volcanic island and the Skaros rock, and come equipped with cable TV, air condition, DVD and CD players, safety deposit box and coffee makers. The resort is located in a peaceful area on the Firostefani cliff side just outside Fira’s centre. Being off the paths of cliff side offers our guests a peaceful, quiet and relaxing secluded experience. Shuttle transfer to the port and the airport is available during summer. Free public parking is possible near Dana Villas. The Acropolis of Rhodes is located at 4.8km and the distance to Rhodes International Airport is 7km. Dana Villas has traditional white washed Santorini architecture, and offers 11 categories of rooms, suites and villas for all guests to choose from. It has two sections--the hotel and exclusive suite section which offers added privacy. 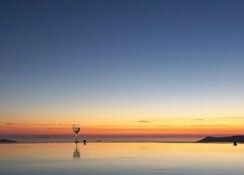 During winter guests may prefer a suite or Villa as they canenjoy the views from their heated private pool or Jacuzzi. The rooms offer lovely views of the Sunset, caldera bay, volcanic island and the Skaros rock, and come equipped with cable TV, air conditioning, DVD and CD players, safety deposit box and coffee makers. 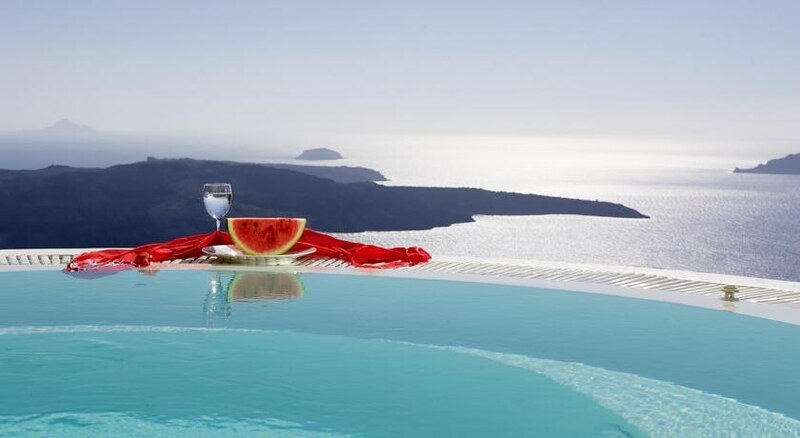 The hotel has a lovely restaurant by the caldera that serves of authentic Greek and international cuisine. Guests can relish a delicious Meze platter while enjoying the lovely tangerine sunset. There are good dining options and bars nearby. Dana Villas has a swimming pool and terrace where guests can soak up the sun. There is Yoga classes and a fully equipped gym for those who wish to stay active. There is a lovely spa with hot tub offering massages and therapies and beauty treatments are available on request. The hotel has facilities for bike and car rentals. The hotel can arrange canoeing, windsurfing and fishing.